mechanical linkage that works the rear wheel brakes (fig. 3-42, view B). HYDRAULIC BRAKE SYSTEM A hydraulic brake system is primarily a liquid connection or coupling between the brake pedal and the individual brake shoes and drums, as shown in figure 3-43. The system consists of one master cylinder connected by pipes and flexible tubing to the wheel cylinders. The wheel cylinders control the movement of the brake shoes at each wheel. When the brake pedal is depressed, the hydraulic fluid forces the pistons in the wheel cylinder against the brake shoes, forcing the shoes against the brake drum or brake discs stopping the wheels. Hydraulic brakes are self-equalizing brakes. If the actuating pistons were all the same size, each brake in the hydraulic system would receive an identical hydraulic force when the brakes were applied, because a force exerted at any point upon a closed liquid is distributed equally through the liquid in all directions at the same time. All brake systems have larger wheel cylinders in the front than in the rear. When you stop a vehicle, more weight is automatically shifted forward due to inertia, so more front-wheel braking is required. The master cylinder is a reservoir for the brake fluid and contains pistons and valves which change mechanical force to hydraulic pressure when the brake pedal is depressed, as shown in figure 3-43. The pressure on the brake pedal moves the piston within the master cylinder to force the brake fluid from the master cylinder through tubing and flexible hoses to the wheel cylinders. As pressure on the pedal is increased, greater hydraulic pressure is built up within the brake cylinders, and thus greater force is exerted against the ends of the brake shoes. When pressure on the pedal is released, the retracting springs on the brake shoes return the wheel cylinder pistons to their released positions. This action forces the brake fluid back through the flexible hose and tubing to the master cylinder. Figure 3-42.-Parking brake configurations. 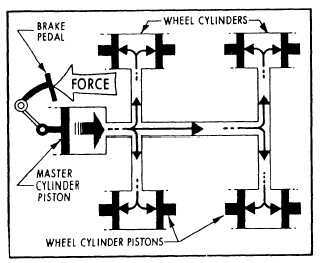 3-23 Figure 3-43.-Hydraulic brake system.